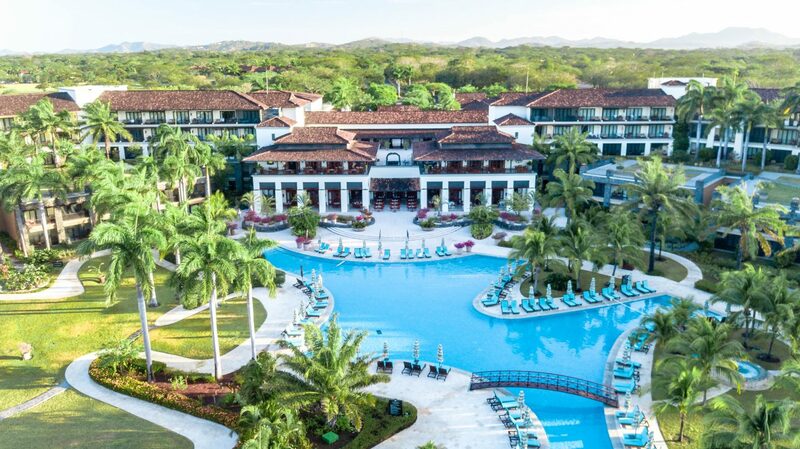 Staying with the JW Marriott Guanacaste was my first stay with the renowned luxury Marriott brand. 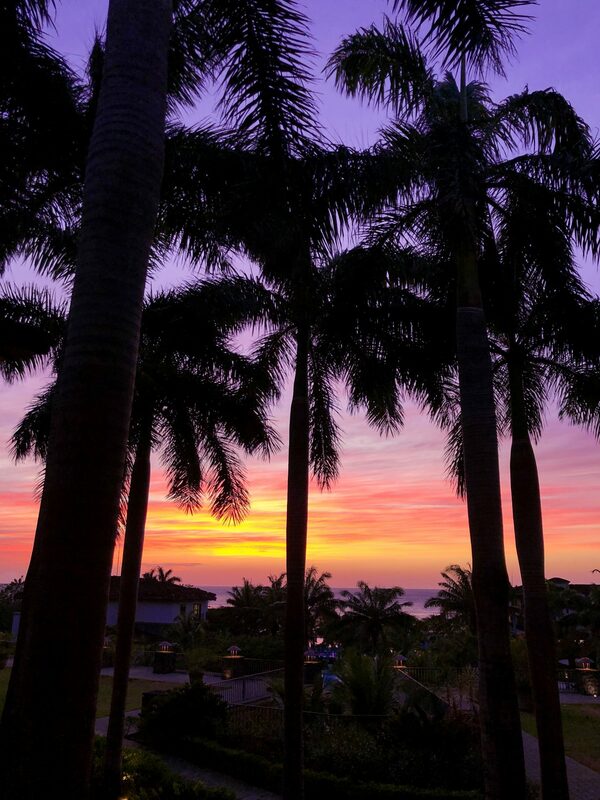 Situated on 4,000 acres of beach front property in Hacienda Pinilla, the JW Marriott is an elegant resort in the middle of a traditional Costa Rican heritage ranch. Hacienda Pinilla is a a stretch of land approximately five 7-minutes south of Tamarindo beach. 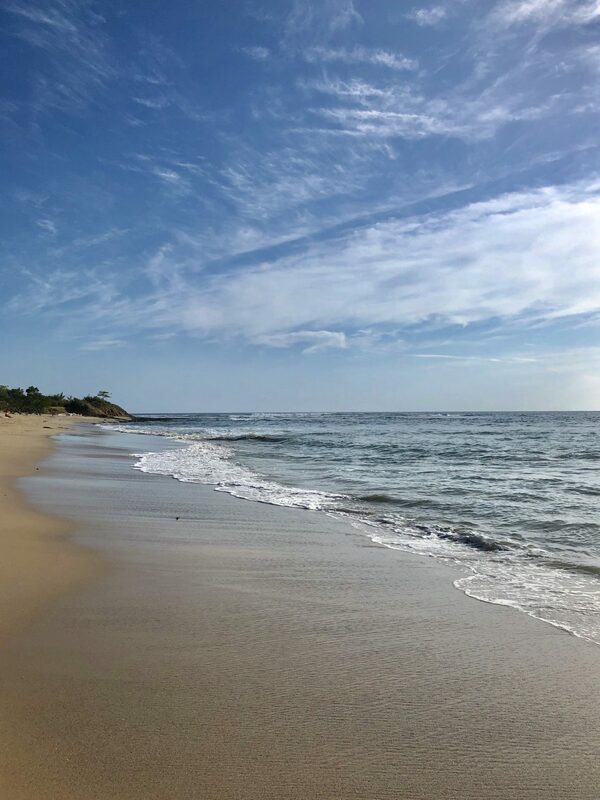 The resort community occupies 3 miles of the pristine Pacific coast and visiting guests get to enjoy the pleasures of staying on a local ranch. 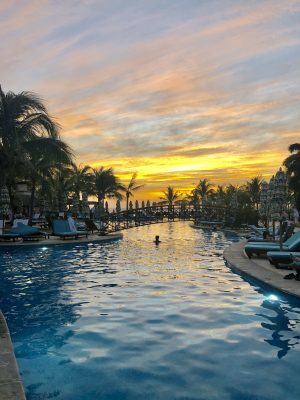 With an 18-hole golf, Equestrian Stable, Wellness Spa and the largest pool in Central America, the resort is perfect for all types of guests and travellers. 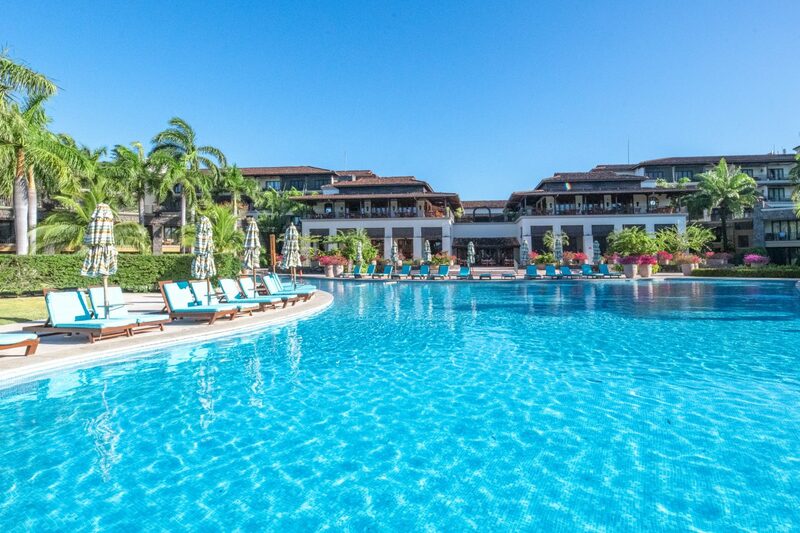 Upon arrival to the JW Marriott Guanacaste, I could feel the elegance of the colonial-style Spanish architecture. Pulling up felt as if we were arriving to a luxe Costa Rican estate in the middle of the forest. As you walk through the main doors, you are greeted with a lovely view of the tropical resort and pacific coastline. The property is sprawling with over 300 luxury rooms, and a vast selection of amenities to enjoy throughout your time there. Due to the vast size of the property, we could hardly tell it was running at a 90% occupancy when we arrived. There are many areas for the guests to enjoy the day. 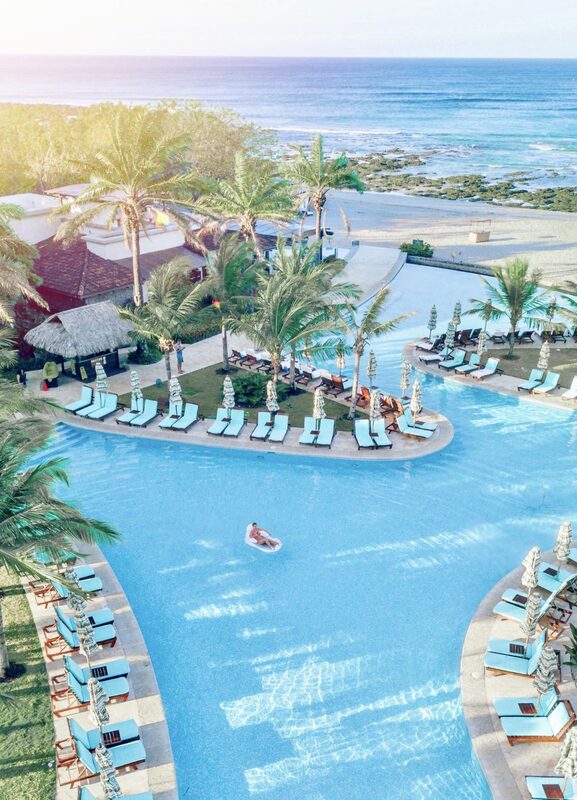 With their enormous pool, you can always be sure to find a chair and with access to 3 beautiful beaches, you have plenty of choices on where to spend a relaxing day. See a highlight of the resort here. There are several rooms categories to choose from at the JW Marriott. All are quite spacious each with their own private terrace overlooking the resort, with a sea view, or overlooking the lush gardens. There are also several one-bedroom suites along with their Presidential Suite, if extra space is a necessity. The room design uphold the classic hacienda-style charm with a modern touch. The decor is very eco-chic with plenty of wood fixtures paired with soft neutrals. 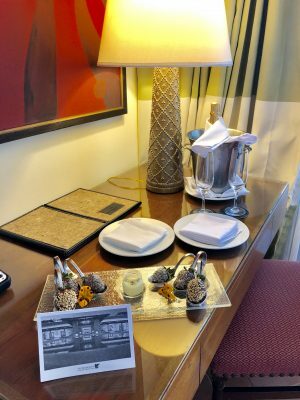 With the sea view rooms, you are in for a treat. The JW Marriott happens to have an epic sunset view, perfectly centre to the hotel. Not only is the sunset perfect to watch from the beach but having the option to watch it from the comfort of your own terrace is quite wonderful. Rooms on higher floors certainly do come with better views but it would be recommended to stay on a lower floor if traveling with children. 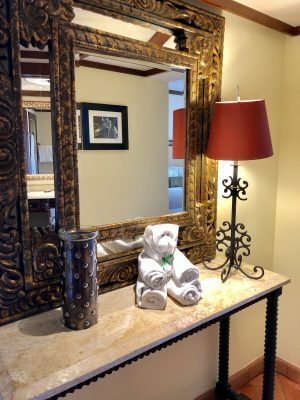 Overall the room was very comfortable, promptly tended to daily and truly made for a wonderful stay. There are many activities close by to enjoy during your time in Costa Rica. Whether it’s Zip lining, scuba diving, deep-sea fishing, you name it, it can be arranged for you. 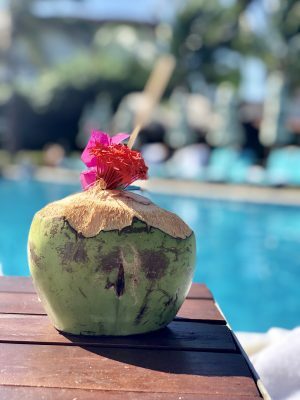 However if you plan to send your vacation purely relaxing on the resort, the JW Marriott certainly has enough to keep you occupied. There are 5 restaurant options found directly on the resort. No matter what you are craving, there is something to satisfy the palate. The day begins with a hearty breakfast at their buffet-style restaurant, Mansita. 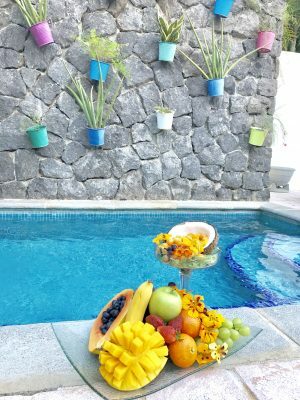 They have plenty of options, including local Costa Rican dishes to enjoy. For lunch, you can choose to dine by the beach or next to the pool. There are 3 different menus to choose from with delicious and healthy options on all. Tamarine – their Asian-fusion option with fantastic sushi! The selection was vast and I was quite impressed with the quality of the meals. The JW Marriott spa provides an experience that rejuvenates the senses. With over 20,000 SQ footage, the spa is gigantic with both indoor and outdoor space. 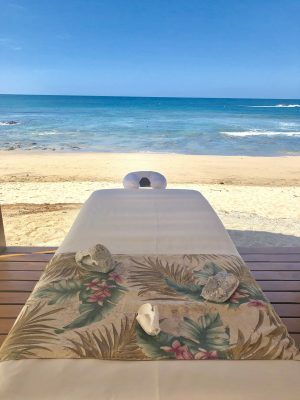 They offer several incredible treatments with the option to enjoy them almost anywhere on the resort. 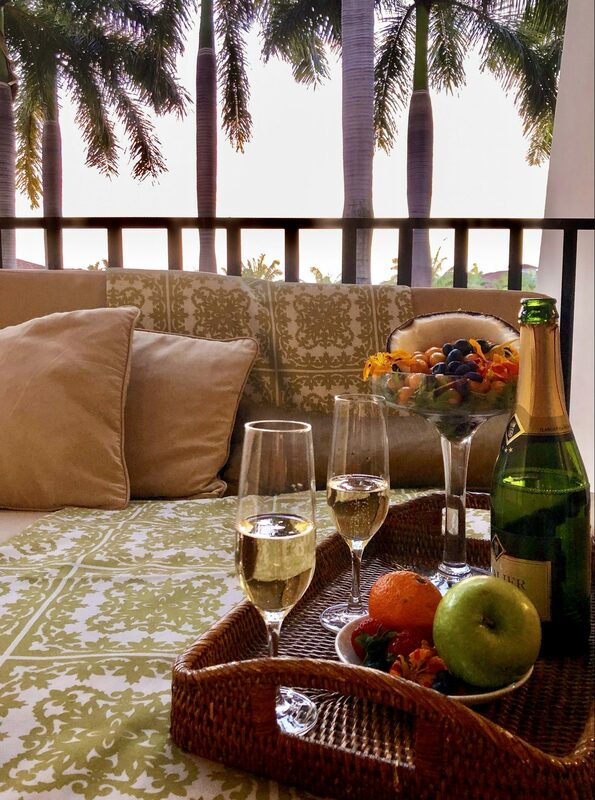 For couples, you are invited to enjoy a massage in a couples suite with your own terrace and bathtub with lush views. The spa is designed to incorporate the elements of nature into your wellness journey. The combination of indoor and outdoor space is soothing to the senses. The pool is HUGE. It has the title of being the largest in Central America and it really is big. There are no shortage of chairs to enjoy poolside and the pool extends all the way to the shoreline with an infinity view. The vibes are very tropical with towering palm trees surrounding the space. The pool service is excellent and staff are always there to tend to you. 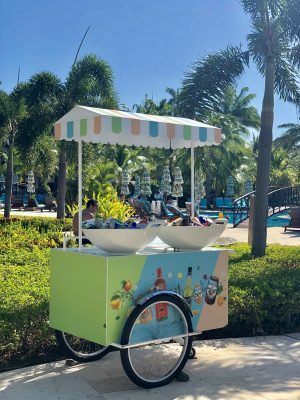 They also have stations set up along the sides offering tropical cocktails and coconuts for refreshments. The pool is very kid-friendly and easy for parents to keep a keen eye on their little ones. Early bird gets the whole pool! 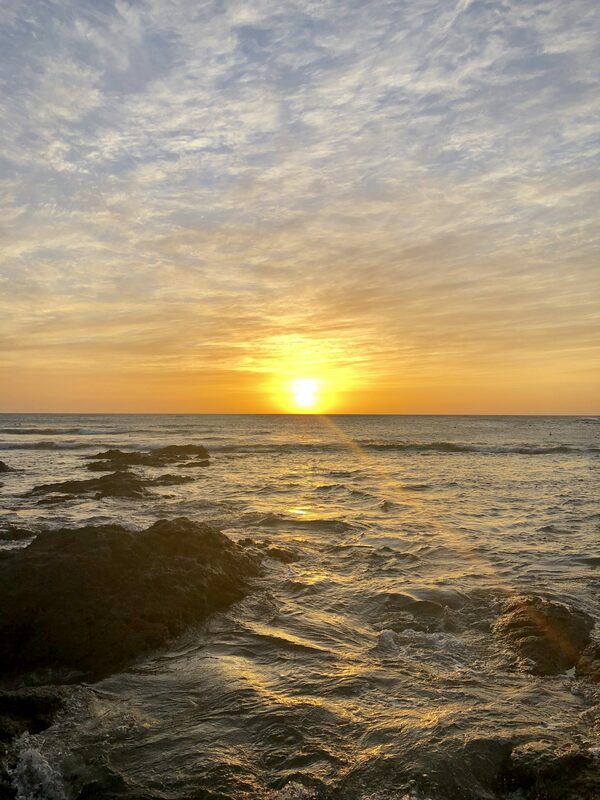 The beaches on Costa Rica’s West Coast speak to the soul. 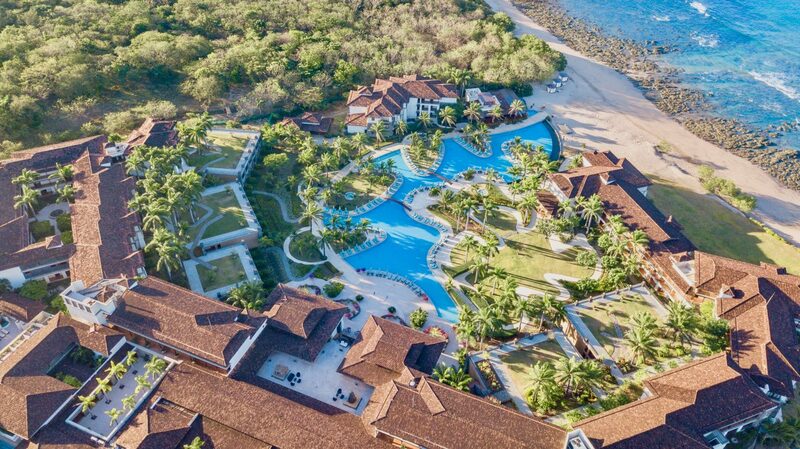 The JW Marriott has two beaches to enjoy on site and 2 others within the Hacienda Pinilla area. The beach on the property is a white sand beach with calm waves to enjoy a swim. There is a rocky area in the water which seems to break some of the bigger waves seen in other areas on the coast. However, if you come to surf, rest assured that there is a surfing beach not too far down the coast. 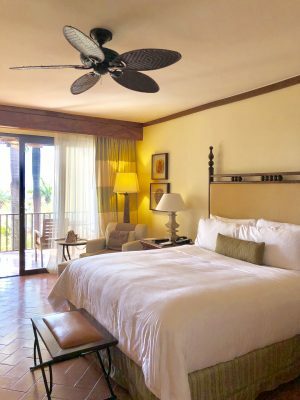 By staying with the JW Marriott, you get the extra benefits of the amenities offered on the Hacienda property as well as the local hot spots nearby. The resort provides transportation around the hacienda to enjoy their 18-hole golf course, the equestrian stable for horseback riding and daily shuttles to the exciting beach town, Tamarindo. 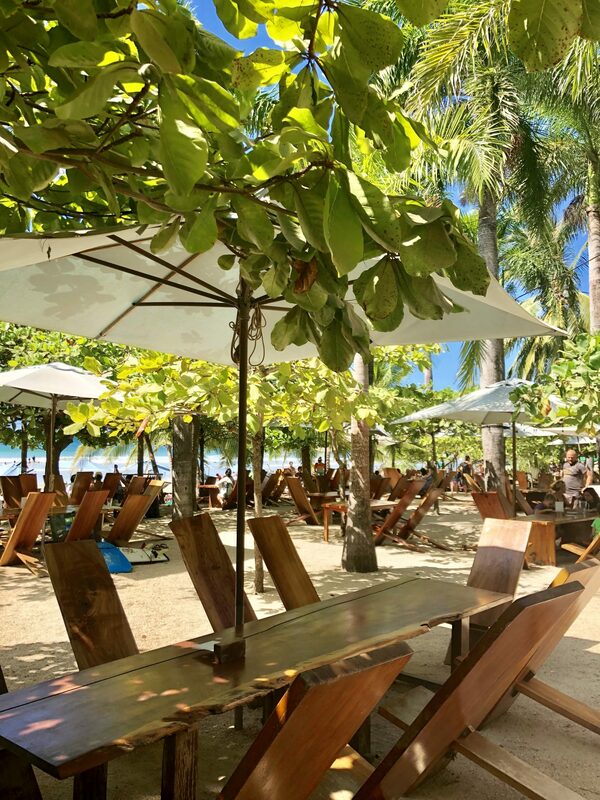 There are also several other restaurant options to choose from in the area including a fantastic beach bar down the way at Playa Avellanas. Lola’s is a popular spot to enjoy some fresh food and drinks with boho beach vibes. It is a local favourite and as soon as you arrive, it’s clear to see why. For activities off the resort and Pinilla property, there are many hikes close by as well as zip lining, volcano touring and of course, wildlife adventures. 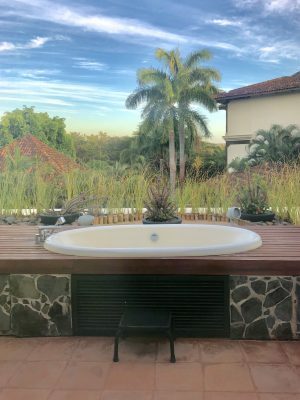 Overall, I had a fantastic stay with JW Marriott Guanacaste. Being my first stay with the luxury brand, my wonderful experience has me wanting to experience more of what they offer. A hotel can never be great without excellent employees and the JW Marriott checks the box. The service was certainly a highlight of my time spend and set the stage for the memorable stay I had. 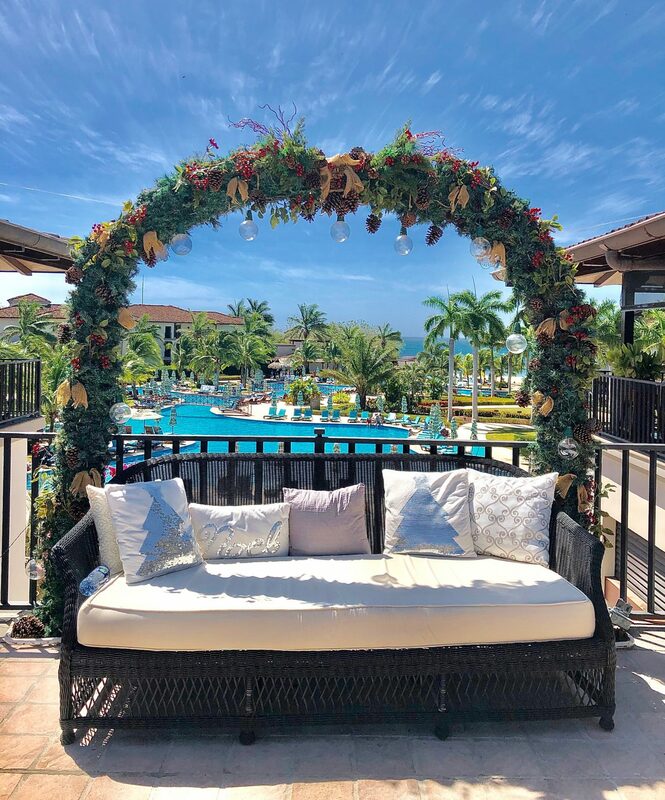 I would best recommend the JW Marriott for traveling couples looking for a romantic vacation with the options or adventure and also for families wanting to experience ‘pura vida’ vibes of Costa Rica with their young ones. 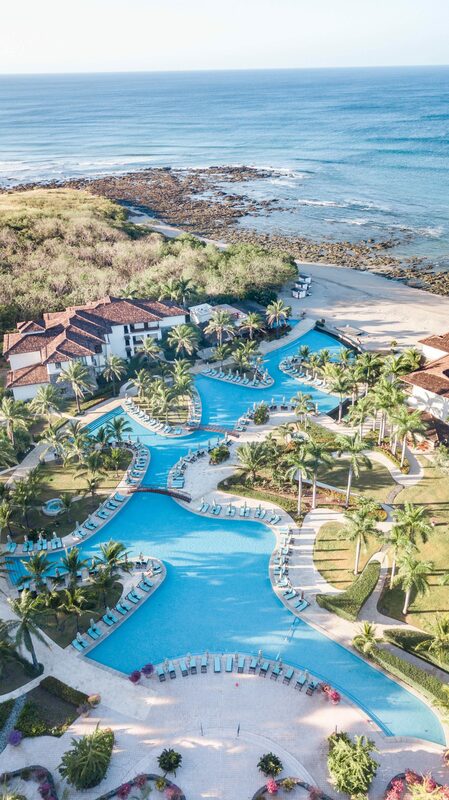 I hope you include the JW Marriott in your travels plans to Costa Rica’s beautiful Guanacaste region! Could you tell me what theme are you making use of on your site? Could you inform me what theme are you making use of on your web site? Hi, how are you? This post has actually been the best thing I’ve read all day. Hi, I'm Tara. 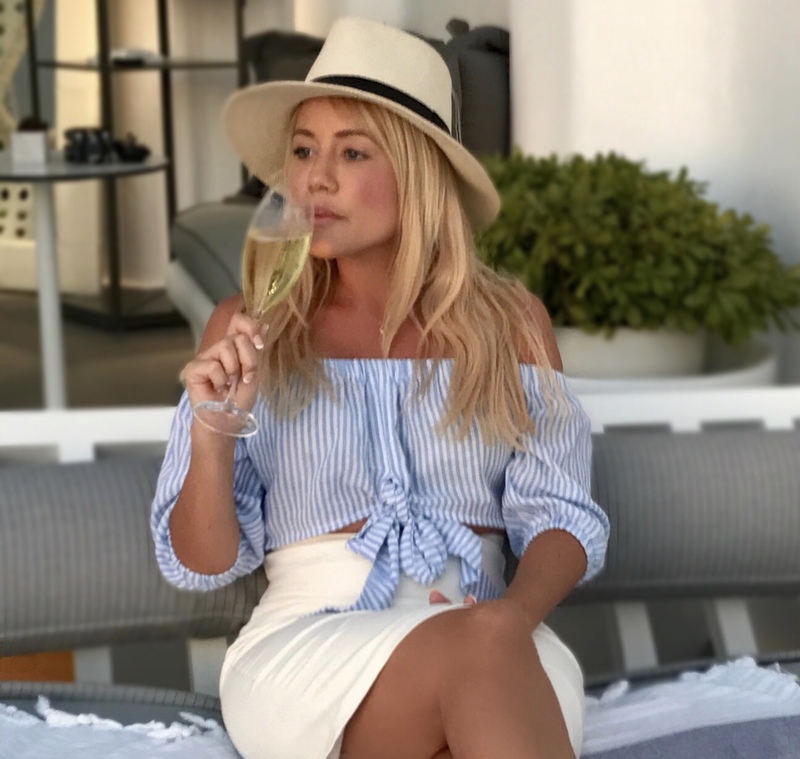 I am a content creator, blogger and luxury travel influencer. I showcase the top luxury hotels and resorts from around the world in some of the most exotic locations and provide tips on how you too can travel luxe. Follow me to your next luxury vacation!